CTS Linear, Long Shaft ¾ in. bushing, split knurled shaft, &frac38; in. bushing diameter. Great in guitars that have a thicker carved top (ex. Les Paul) where added bushing length is required. 250 kΩ R-VC250KL-SP-L Packaging Dimensions 1.575 in. x 1.275 in. x 0.965 in. 250 kΩ R-VC250KL-SP-L Shaft Diameter 0.235 in. 250 kΩ R-VC250KL-SP-L Weight 0.052 lbs. 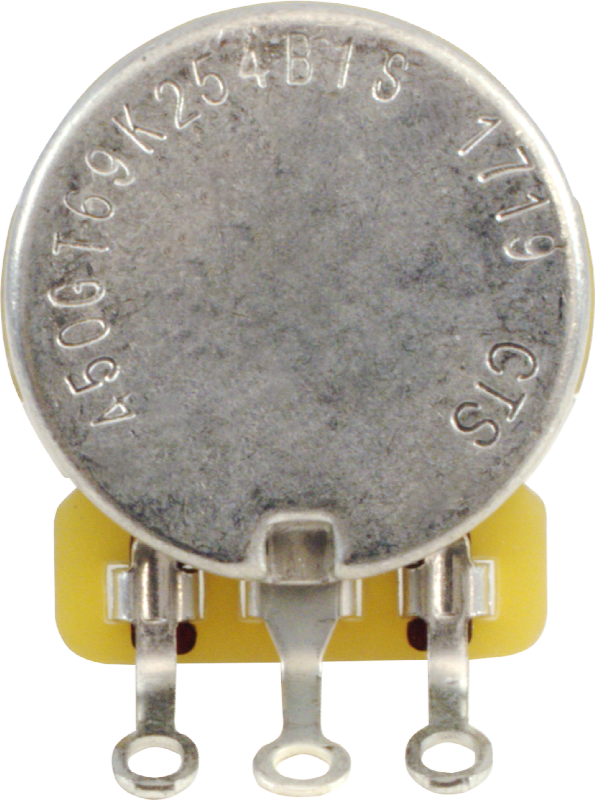 500 kΩ R-VC500KL-SP-L Packaging Dimensions 0.937 in. x 1.27 in. x 1.197 in. 500 kΩ R-VC500KL-SP-L Shaft Diameter 0.24 in. 500 kΩ R-VC500KL-SP-L Weight 0.04 lbs. All models Bushing Length 0.75 in. Asked by vicath@aol.com on September 23rd, 2016. This is a linear taper pot and guitars typically use an audio taper pot. 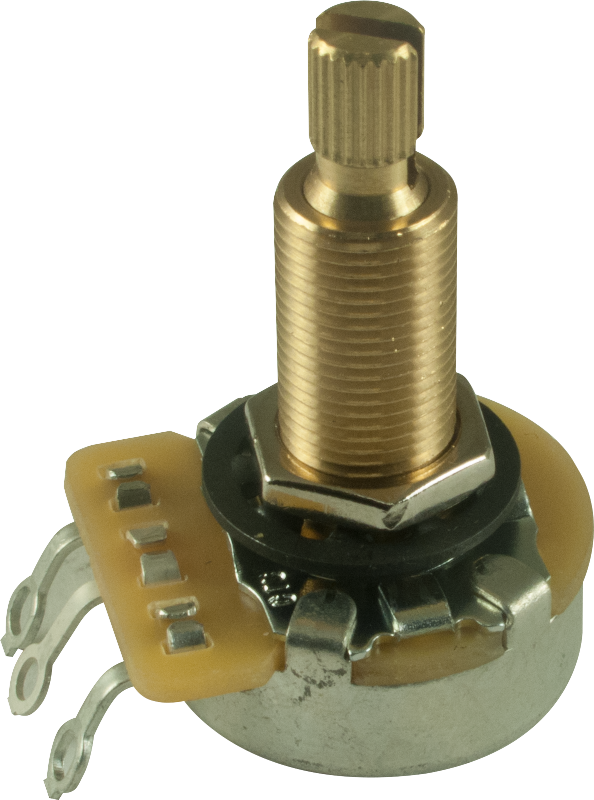 Please search for part # R-VC500KA-SP-L to find the audio taper version of this pot. Some use linear, more so for volume when a more steady change is desired throughout the full range rather than the "swell" of the audio taper as it goes past 50%. If your current pot measures about 250k at 50%, then it is linear. But I think his question had more to do with depth - by now I'm sure his is all set. Asked by Anonymous on January 3rd, 2017. Hi, 6mm is equivalent to 1/4". 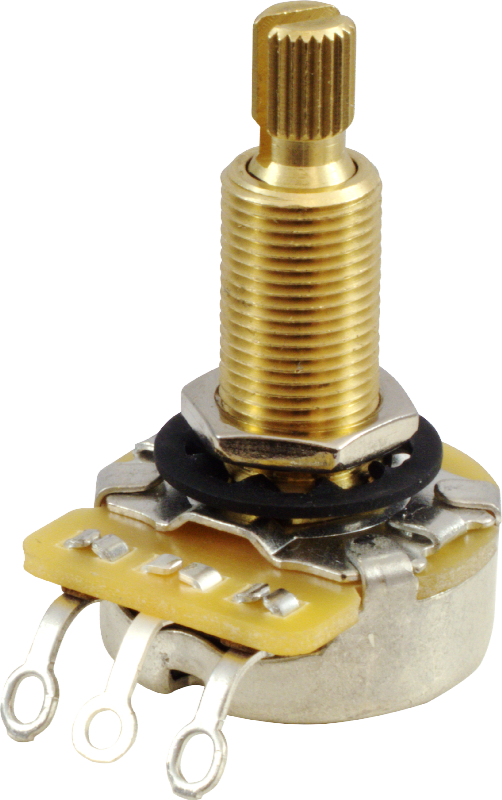 These will work with 1/4" (6mm) push-on knobs.